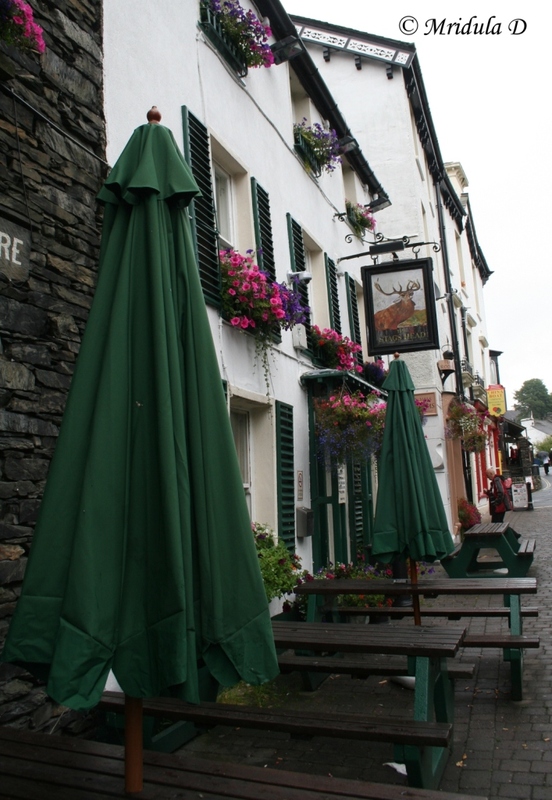 During my visit to the Lake District I at stayed at the Stags Head Hotel on Bowness on Windermere for two nights. It is a two minutes walk from the lake. The location of the hotel is great. Stags Head was recommended to my by the travel agents at the Lancaster University. They quoted me 80 pounds per night as the room rent. When I heard of it first I told them I need a day to think over it because I was not sure I wanted to spend that kind of money. But after a day I booked the hotel as I was sure this was very centrally located and given my poor sense of direction I wanted to play it safe. At the time of the booking itself I was told by the young girl at the travel agent’s that the hotel has live music till late at night and if it was OK with me? Well, I sleep like a log so I said yes it was fine with me. If they played loud music (which they must have) I soundly slept through it all. I was told that the hotel is a 2 mile walk from the railway station and I decided to walk. On the way I asked someone if I was on the right track and they told me there was a bus in a minute and would I really like to walk? I decided to take the bus in the end as my bag was heavy. He was himself getting down at the Church Street, where the hotel is, and I got down along with him. The hotel was right in front of my eyes and I heaved a sigh of relief. I walked towards the entrance only to find a sign telling me to use the other door. But the other door worked fine so I was inside safe and sound. There is no reception and you have to declare your arrival at the bar, which is fine by me but initially I found this confusing. I was early and I was told that the check in time is 2.00pm. I asked them if they would keep my bags? They readily agreed to it and gave me the keys to my room too. My room was on the second floor with a view of the Church Street. I went to roam out after checking in and leaving the bags with them. I was delighted to find that the Lake Windermere was actually just next door. But food was the most immediate issue on my mind. I tried Fish and Chips from a shop that was recommended by a colleague (opposite the Beatrix Potter World, the smaller of the two shops) but I realized that I like my vegetables more than fish. So a little after two I turned back and was shown to my room. My bags were carried up by the hotel staff and I am very thankful for it because they were heavy. I had after all packed for a 10 day trip to UK from India and not a two day trip to the Lake District only! 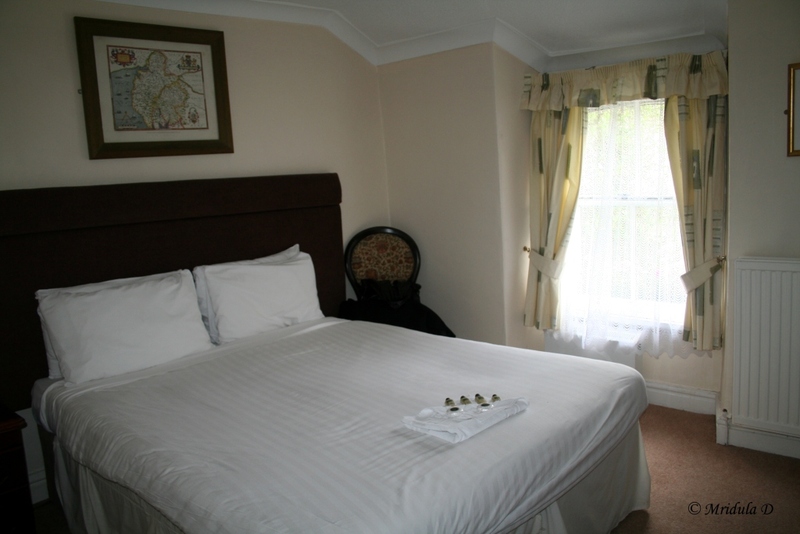 The room was clean and comfortable with a healthy supply of tea and cookies. For me the very definition of a good hotel is one that is not stingy about tea and Stags Head is not at all stingy about tea or the cookies at all. I was also wondering if the supply was meant for two days of my stay because it was generous but I knew I would finish it off in a day. But they were good, the next day there was fresh supply of tea and cookies and it was once again generous. So full marks to them for it. The bathroom was also nice with a shower with good water pressure. But then came my stumbling block. As I was traveling alone and internet was the main way to stay in touch with folks back home I was depending on their wifi. After taking a quick bath I ran downstairs to get the wifi password. You must be wondering why I did not call? Because the phone numbers were not next to the phone but hidden away in some drawer that I discovered only a little before I was checking out. I was given the wifi password promptly. The password worked but the connection was not good after the first time. I was not expecting this in a hotel room that charged me 80 pounds per night. In fact I remember when I went down I asked if wifi was separately charged? And two gentlemen at the bar told me with a dead pan expression that it was 20 pounds an hour and then started laughing. I told them not to confuse me any further. I went back and the connection worked for a while. I was able to let the world know that I was safe and sound and then went out to explore the place. But after this initial success the wifi was never good. When I complained I was told Costa Coffee was down the road and they had a free wifi. But then I didn’t pay Costa Coffee 80 pounds a night and I am not sure they would be open after 8.00 pm or so. Also I was not sure if I could just go and use the wifi without ordering anything. But I was so sick and tired of not having the wifi and that the next day I had my dinner at Costa Coffee so that I could use the wifi. The nonfunctional WiFi was the biggest fail for me at the Stags Head Hotel. And it is for this reason alone I would not stay there again. The only meal I had at the Stags Head was the breakfast as it was included in my room rent. And once again the breakfast was good, the full English fare. I ordered it minus the meat. When it arrived on the first day I was quite taken aback, the portions were just too big for me! I called the server and asked if these were the portions and he went on the defensive saying yes, was anything wrong with them? I requested him to reduce the portions as I did not wish to waste food. He gladly took it away and got me less that I could finish with relish. The next day he himself asked if I would like my smaller portions to begin with and I agreed. Overall it was a decent place if you can sleep through the music, which I can but the bad wifi was a big downer for me. If I anyway go to the Lake District again I would like to stay at Grasmere as it is a smaller and quieter town much more to my liking. Not that there is anything wrong with Windermere it is just that I liked Grasmere more. You can see more reviews about the Stags Head at Tripadvisor. The good part about being in a nation which gets a large number of tourists is that you do not feel shy to take out your camera! I got unusually good weather this time in UK. For all my days at Lancaster I got sunshine everyday and never needed to take out an umbrella. I had a good sunny day on my Edinburgh trip too. But not at Winderemere in the Lake District. After about 2 hours of lukewarm sun it became overcast and it always remained overcast and rained as well. However I quite enjoyed the way the raindrops seem to be running on the train window hence this short video.